Smart technology has advanced to the point that, yes, even your home--the place you live--can be enhanced into a smart home. We're here to help your home get there. With this giveaway, you'll receive a Skybell Wi-Fi Video Doorbell, a WeMo Switch to turn anything on or off, a Philips Hue White Starter Kit to control light levels, a Nest Thermostat, and an Amazon Echo. With Alexa voice commands, you can control all of it. Just say the word, and she'll be there. Amazon, Skybell, Belkin, Philips, and Nest are not affiliated with this contest. This promotion is in no way sponsored, endorsed or administered by, or associated with, Facebook. You are providing your information to StackCommerce, Inc. and not to Facebook. The StackCommerce Sweepstakes (“Sweepstakes”) is open to all humans age 21 or older at time of entry. Restricted to residents of the US only. Employees of StackCommerce, Inc. (the “Sponsor”), its respective parent, subsidiaries, affiliates, advertising and promotion agencies, distributors, merchants involved with this Sweepstakes, and their immediate family members and/or those living in the same household of each are not eligible to enter or win. Sweepstakes governed by U.S. law. Sweepstakes is subject to all applicable federal, state and local laws and regulations. Void where prohibited by law. No purchase necessary to enter or win. A purchase will not improve your chances of winning. 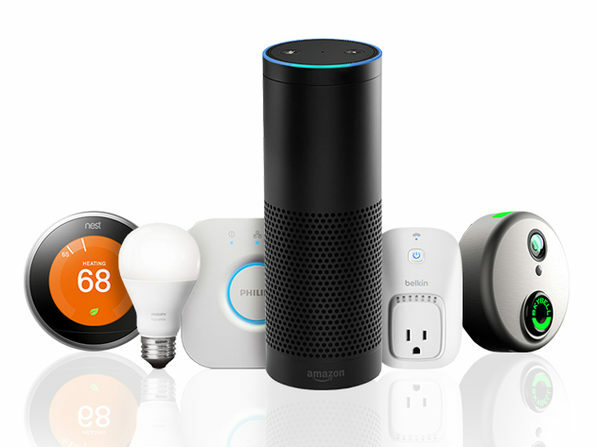 Maximum ARV of the prize – approximately up to $746.00 (the price of one (1) $179.00 Amazon Echo, one (1) $39.99 Belkin WeMo Switch, one (1) $199.00 Skybell HD, one (1) $79.95 Philips Hue White Starter Kit, and one (1) $249.00 Nest Thermostat). If winner is unable to receive prize then prize will be forfeited, and an alternate winner may be selected in accordance with these Official Rules from among the remaining eligible entries for that prize. Prizes may not be transferred or assigned except by Sponsor.